Since early 2016, Yemeni forces belonging to the Aden-based Hadi government have been fighting Houthi militants and other forces loyal to ex-President Saleh in Hajja governorate, one of the few positions in northern Yemen controlled by the Aden-based government. The strategic Midi district has witnessed the fiercest battles ther, and remains largely disputed. On 21 November 2016, Houthi-linked Al Masirah TV ‘s YouTube channel uploaded a video showing arms and munitions allegedly captured in the Midi district from Saudi-backed forces. 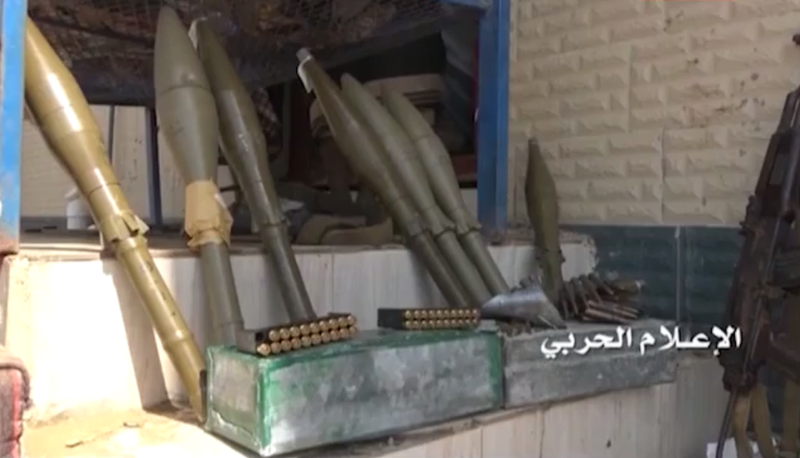 A still taken from the video shows munitions unlikely to be in service with pro-Hadi forces, however. 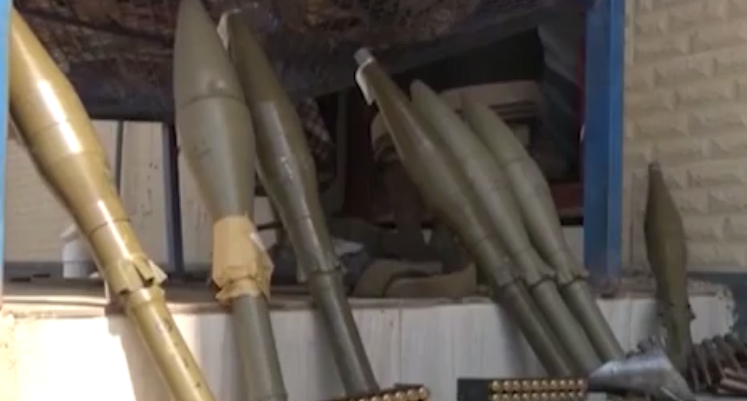 Figure 1.1 Still from a video showing arms and munitions allegedly captured in the Midi district from pro-Hadi forces. Figure 1.1 shows two types of RPG-7 shoulder-fired recoilless weapon: PG-7M type and the Iranian Nader. The former can be recognized by its narrow diameter and visible safety cap, which covers the nose initiating element of a VP-7 type point-impact base-detonating (PIBD) fuze (1st, 3rd, 4th, and 7th projectiles from left). PG-7M pattern munitions are manufactured by Russia and other former-Warsaw Pact countries, and remain widely available within the broader Middle East region. The remaining three projectiles lack the piezo-electric initiating element described above. Whilst other designs, including the North Korean F-7 HE-FRAG projectile lack this element, the distinctive rounded projectile shape is consistent with the Iranian Nader projectile. Designated the PG-7-AT and also known as Fath in some Iranian sources, this round has not been documented in service with Saudi-backed forces in Yemen. Conversely, the Nader has been documented in service with Houthi forces. Whilst it is feasible that some Nader projectiles were transferred to pro-Hadi forces via battlefield capture, these examples most likely originated with pro-Saleh forces. Figure 1.2 the PG-7-AT projectile, AKA ‘Nader’ or ‘Fath’. Initially developed by a West German firm for the Shah’s Imperial Armed Forces, Iran later began to manufacture and export the Nader. Examples of the PG-7-AT and its derivatives have been documented in Afghanistan, Côte d’Ivoire, Iraq, Israel/Palestine, Mali, Sudan, Syria, Turkey, and elsewhere (see Figures 2.1 to 2.5, below). This makes the Nader one of the most recognisable Iranian RPG-7 projectiles. 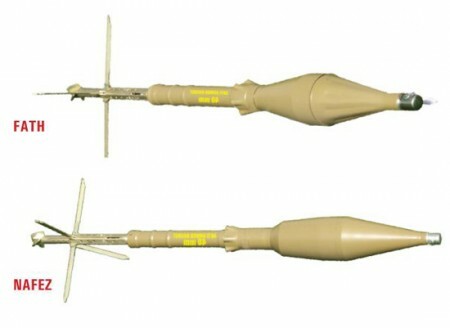 In addition to the basic projectile pictured in Figure 1.2, the Nader is also the basis for a version with improved penetration (known as the ‘Enhanced Nader, ‘Optimized Fath’, or ‘Nafez’) and a tandem variant. Each can be recognized by the lack of a conventional PIBD fuze. Instead, the projectile functions when the inner and outer layers of the nose shield are crushed together upon impact. It is assessed with moderate confidence that production of the basic Nader and Nafez rounds was superseded in the early/mid-2000s. Later Iranian production of RPG-7 projectiles has tended towards copies of conventional Soviet designs. The basic PG-7-AT (Nader) was replaced by a more conventional PG-7 copy known as the PG-7-AT-1 (also known as the Fath in some Iranian sources), while the Nafez designation was retained and applied to a PG-7L copy (see Figure 1.3, below). Similarly, the latest version of the anti-personnel (HE-FRAG) Saegheh projectiles appear to be closer derivatives of the OG-7 series. Each of these later iterations feature PIBD fuzes with initiating elements located at the nose of the munition, typical of RPG-7 projectiles produced globally. 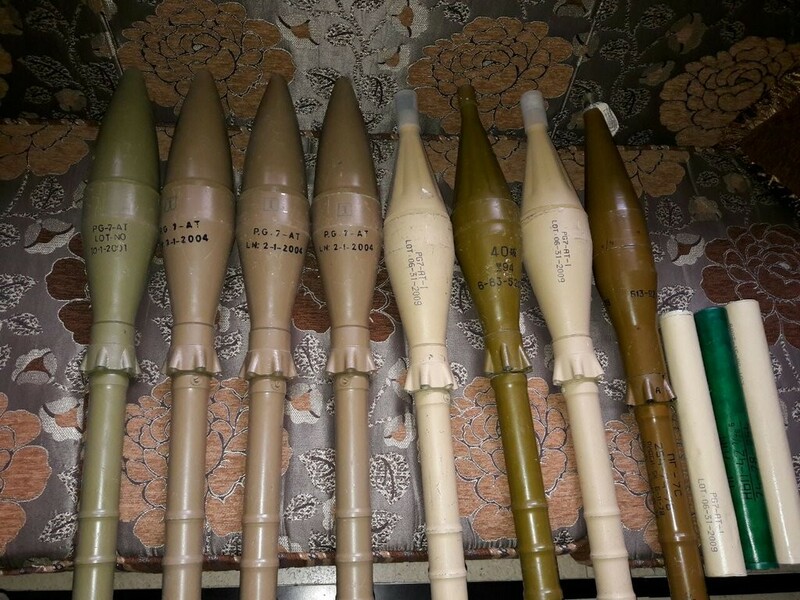 As with many Iranian munitions, RPG-7 projectiles have been documented in several colourways, including at least two shades of olive drab, dark green, and at least two shades of tan. Figure 1.3 An image taken from a recent Iranian export catalogue, showing the PG-7-AT-1 (AKA ‘Fath’) and Nafez (PG-7L copy). Iran has been long suspected of providing military assistance to Houthi forces. ARES has previously documented the use of North Korea’s Type 73 GPMG by Houthi forces, and has produced a series of confidential assessments examining other examples indicating probable support. 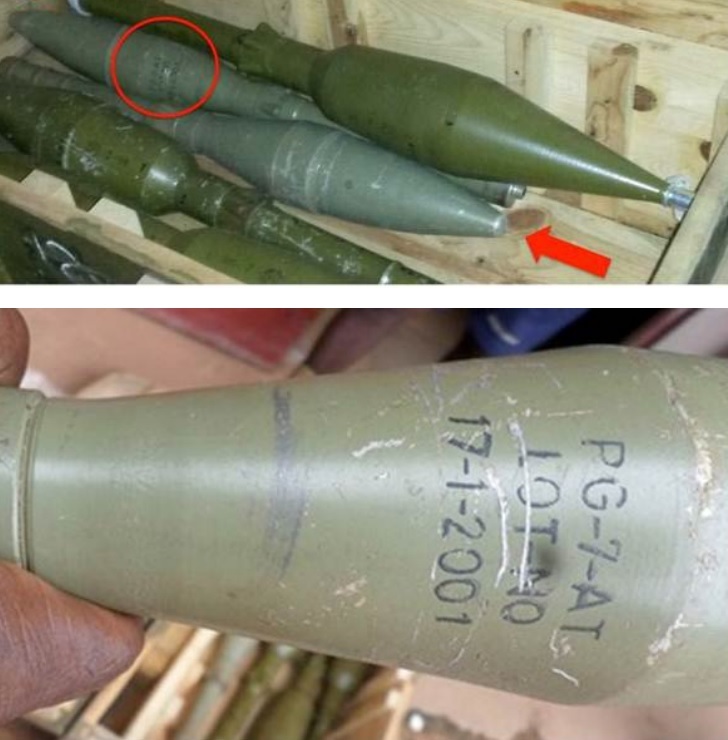 Whilst it remains unclear whether these Nader projectiles are part of a recent delivery by Iran or an extraordinary case of proliferation from another country like Sudan, the presence of these munitions in Yemen is likely to indicate Iranian supply. Penetration: 270 mm of RHA after ERA. Technical specifications drawn from Iranian export catalogues. Special thanks to N.R. Jenzen-Jones, Galen Wright, and a confidential source. 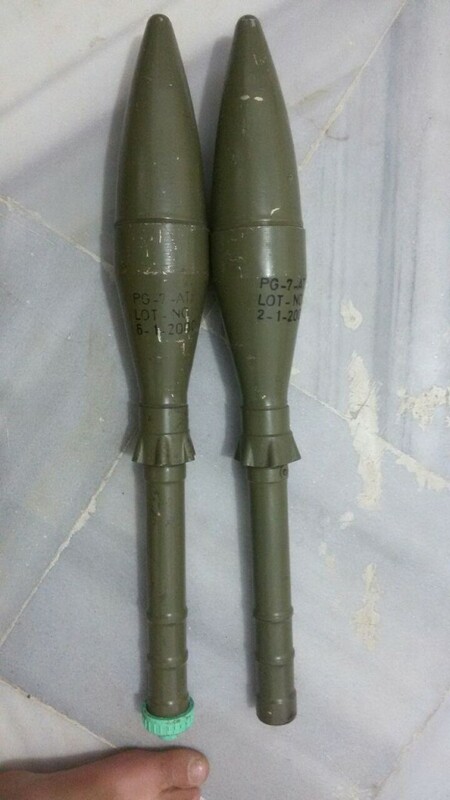 Figure 2.1 Nader (PG-7-AT) projectiles for sale on the illicit arms trading market in Syria, 2016 (ARES CONMAT). Figure 2.2 Nader (PG-7-AT) projectiles for sale on the illicit arms trading market in Iraq, 2016 (ARES CONMAT). 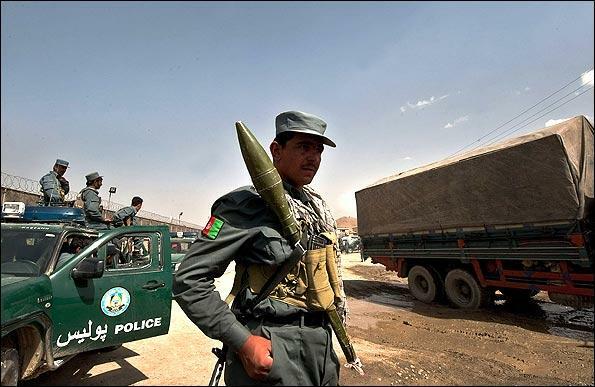 Figure 2.3 Nader (PG-7-AT) projectile in Afghanistan (ARES CONMAT). Figure 2.4 Nader (PG-7-AT) projectiles documented by UN inspectors in Côte d’Ivoire, 2014 (UN Security Council). 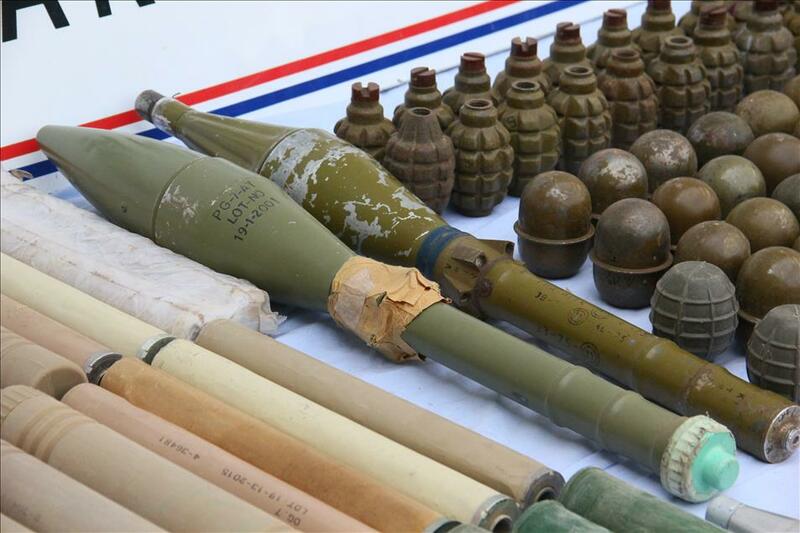 Figure 2.5 Nader (PG-7-AT) projectile allegedly seized from PKK units in Turkey (Anadolu Agency).